We introduce the balanced dispatching problem in passengers transport services on demand, such as taxi services, and propose an easy-to-implement algorithm in an online scenario, where all necessary information is only revealed with the arrival of requested transport services, seeking to guarantee quality of service for the passengers as well as balancing the income received by the drivers of the vehicles who perform the transportation services. The algorithm is based on theoretical results from the balanced incomes per worked time through the income variance minimization problem for two transport vehicles, considering the incoming service tariff, the performed services and the worked time by the transport vehicle drivers during the pay period in an online scenario. We compare our algorithm with the online dispatching algorithm currently used by Chilean companies on real instances. The numerical experiments are based on three different data sets of real instances such a labour day, one week, and one month, respectively. 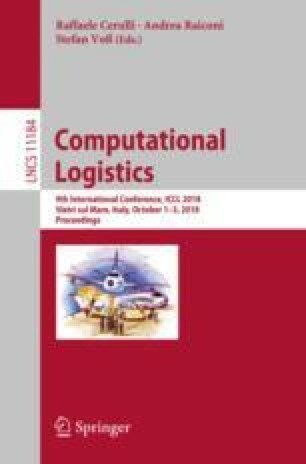 The obtained results show that the proposed algorithm is able to efficiently reduce the income dispersion among transport vehicle drivers within reduced running times, allowing a practical implementation into an automated dispatching system. This work is partially supported by DICYT No061817OP, Universidad de Santiago de Chile.